Our boat is capable of taking up to six passengers. 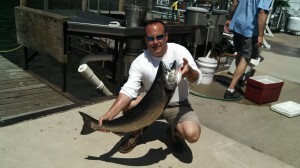 All charters are operated by a USCG Licensed captain who will guide your sport fishing experience. 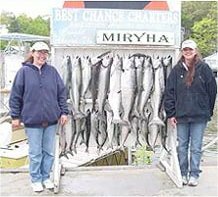 Charters can be set up for times that best fit your schedule, with most customers doing either half-day or full-day sport fishing experiences. Half Day Charters – $650.00 for one to four people ($700.00 for 5-6 people). Morning 6am to Noon or 7am to 1pm. Full Day Charters – $800.00 for one to four people ($850.00 for 5-6 people). If these options aren’t quite what you are looking for, then give Capt Mike a call at the number below to discuss a time that works for you. All major credit cards, check, and cash accepted for payment. *Prices do not include gratuity for crew which is greatly appreciated.